So Michelle of Galleysmith and I thought since our joint reviews were so successful last August, we'd do it again. These are more in-depth than my usual reviews and discuss plot points in a non-spoilery way. We'll post about a different book every Thursday, and our second book is THUMPED. There are spoilers for BUMPED in this discussion, so if you haven't read that, please see my BUMPED review instead. It’s been thirty-five weeks since twin sisters Harmony and Melody went their separate ways. And now their story has become irresistible: twins separated at birth, each due to deliver twins…on the same day! Married to Ram and living in Goodside, Harmony spends her time trying to fit back into the community she once believed in. But she can’t forget about Jondoe, the guy she fell for under the strangest of circumstances. To her adoring fans, Melody has achieved everything: a major contract and a coupling with the hottest bump prospect around. But this image is costing her the one guy she really wants. 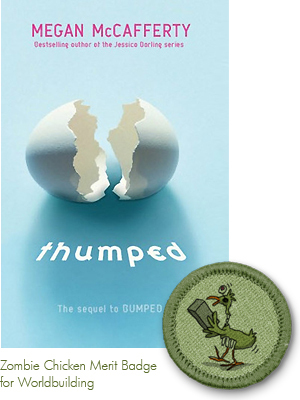 You'll notice that I gave THUMPED the Zombie Chicken Merit Badge for World-building. This was a close call, because it has a lot of offer as far as twists, great writing, action and romance too. This is one that'd get FIVE merit badges if I did that sort of thing. Michelle and I decided to discuss four topics: Genre classification, Fun Factor, Moral of the story and Romance. The first two we discuss below, the second two we discuss over at Galleysmith. Can’t say I disagree with a thing you’ve said. It’s so completely styled in a futuristic society that I can’t help but love how McCafferty has created this over-the-top premise in which she so subtly speaks to some serious moral issues. It’s the satire that makes this book for me more than the dystopia though. That it feels so much more light-hearted than the subject matter makes for a fantastic read. One that I enjoy picking through the nuances of. What I’ve always liked about this world is that we get such a rich cultural society (effect) developed as a result of the infertility virus (cause). McCafferty’s thought of everything - from advertising jingles, to pushy “stage” parents who lead seminars, to popularity & celebrity based on fertility (so ferticilious!). But where “Otherside” is more light-hearted, you definitely see some heaviness in “Goodside” - what with the threat of shunning and kidnapping and all. Goodside is the more dystopian of the two for sure. Very rigid and oppressive in a “what we say goes” way. Thanks in part to its intricate world building and clever invented slang, BUMPED was my most memorable read in 2011. I was super excited for THUMPED and it really delivers (do you like my use of double meaning? lol). These two books were so much fun, I wish Megan McCafferty would write 100 more books in the series. The plot is very much in the vein of madcap comedy, with Melody and Harmony living a farce as the celebrity “hotties”: twins set to give birth to twins on the same day. Melody wants Zen, but has to pretend to be in love with Jondoe, while Harmony is back in Goodside with her husband Ram but yearns to be with Jondoe. It’s a set-up ripe for drama. DITTO THAT on the “more books please” factor! Like you, I loved Thumped’s predecessor and came into this book with high expectations. I was not disappointed in the least. The slang alone makes for a strong entertainment factor but then add in Jondoe’s highjinks and it’s just laugh out loud at times. McCafferty definitely did a fabulous job mixing it up so that readers aren’t overwhelmed or preached at, but rather learn about this society and important issues in a really enjoyable way. Jondoe’s disguise was priceless! And I loved the condom scene - uncomfortable but oh so funny. The plot twists were fun too. Some of them I definitely expected, but others were really surprising. Jondoe was definitely the comic relief here. 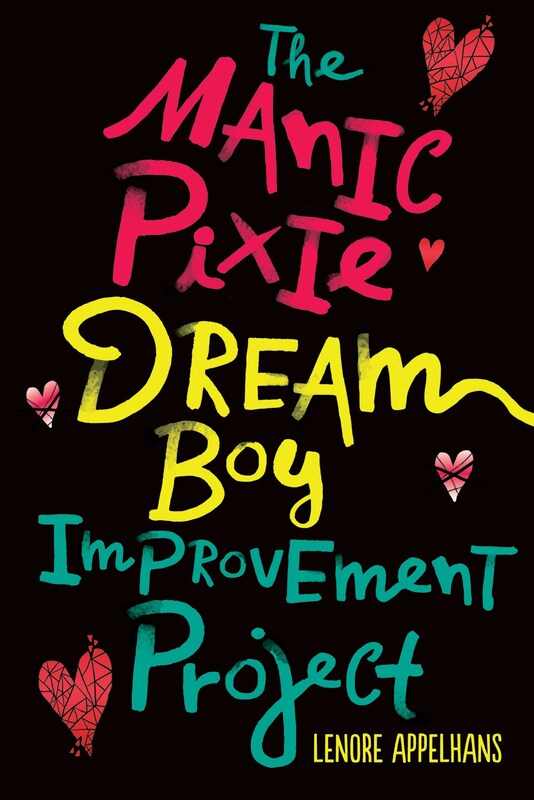 His antics in effort to win Harmony (whether intentional or not) were the highlight of the book. Don't miss the rest of the discussion over at Galleysmith. Michelle has a very dirty mind! Find out more about the series at the author's website. FTC disclosure: The author sent me this book. LOVE these joint reviews! Such a good discussion! I AM SO STOKED TO READ THIS ONE! I loved Bumped and loved listening to Megan McCafferty read from it when I went to the book release party for it! Sometimes I get lost when there's too much world building, so I'll have to think about this one. I just bought Bumped a couple of days ago, after remembering how much you loved it. I didn't want to spoil it, so I will have to come back to this review when I am done. Wow, I'll have to re-read Bumped; I completely forgot about Melody's pregnancy. I'm so excited for this book though, not to mention that I totally agree that McCafferty's worldbuilding is fantastic. Great double review! I love the whole culture/world built around these teens getting preggers, the fashion, commercials, and the slang. The satirical slant really makes you stop and think. (ie: Teen Mom) Excited about Thumped! I still haven't read Bumped, and your review has reminded me to "bump" it up my tbr list. That's not even punny, self, that's just shameful. I'll try and restrain myself in further comments. I enjoyed BUMPED even though it took me some time to get through the slang...and I'm looking forward to THUMPED. I can't wait to see how this all plays out. And you two are so funny! I read BUMPED as an ARC & LOVED IT! Can't wait to reread it AND then devour THUMPED! I have not read Bumped yet but after reading the summary it looks so interesting and crazy! I'd like to give it a try. I'm still behind on reading Bumped. My copy got lost in the mail. But after all the controversy, it's been high on my wishlist. I had totally forgot ''BUMPED''. I loved its story, it is so unique. I was very excited about this book when I read for the first time the summary. And I forgot to read it, shame on me. Thank you for reminded it to me.